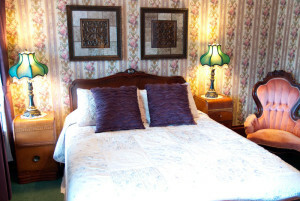 A very private room offers a mahogany Queen bed with a floral quilt, a unique vanity, and armoire. 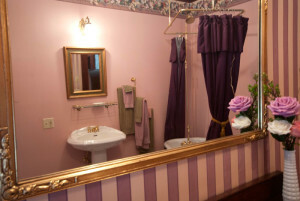 Overlooking Main Street, this romantic room is filled with shades of purple, lavender, pinks, greens, and dark woodwork. The bright, oversized tiled bath includes a clawfoot tub and shower with large dressing area. Note: The balcony is currently closed due to renovation.